If the rise in my web traffic and email inquiries over the years is any indication (and I think it is) then appreciation and interest in “Interactive-Visuals” is exponentially rising. 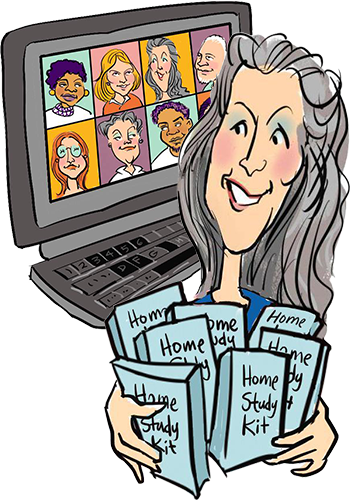 As a senior Graphic Facilitator (my love affair with the visual way of working began in grad school in San Francisco in the mid 90s) … I get all sorts of emails and phone calls from potential clients wanting to book me and/or ask me to recommend quality referrals in their area. As such, I think an article on how to effectively select the right Visual Practitioner is in order (and it’ll act as a handy resource to make my client responses easier too!). Susan Kelly, a colleague of mine from back in the day, did a wonderful chart that I use in my Fundamentals of Interactive-Visuals workshop called “What’s in a Name”. In it she lists the many, many different terms that Visual Practitioners use to describe their work … varying from Graphic Recorder, Visual Scribe, Graphic Facilitator, Visual Facilitator, Visual Synthesis, Corporate Graffiti Artist, Mindmapper, Meeting Doodler and the like! While this diversity is fun and entertaining … it does make it a little challenging for people new to the field (especially new potential clients) to weed through the confusion to find the right professional practitioner to meet their needs. 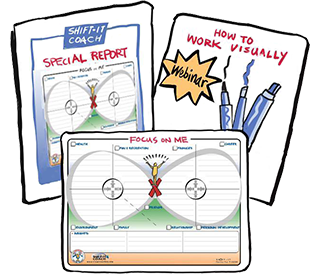 Which Kind of Visual Practitioner Do You Really Need? The first thing I do when I receive a new inquiry is to clarify terms. What kind of Visual Practitioner does this client truly need? If they are an individual seeking coaching assistance in a visual way, then they need a Visual Coach. If they are with a group or an organization, then the questioning becomes a little deeper. Do they need a scribe who subtly and quietly takes summary notes off to the side (called a Graphic Recorder or Visual Scribe)? Or do they need a facilitation professional called a Graphic or Visual Facilitator who not only designs an appropriate intervention (based on their process expertise) but also leads it in a visual way (either doing the visuals themselves or working in tandem with their visual team). These are two very different roles … with different skill sets, backgrounds and education. For a more thorough examination of terms and roles, please see previous article: The Four Ways to Work Visually. I myself no longer book out on Graphic Recording or Scribing gigs these days as I’m a lead Graphic Facilitator who creates and facilitates strategic planning forums (in addition to the training, mentoring and coaching I do). However, we do have a global Preferred Partners Network of seasoned colleagues and mentees. So, if I’m not available or the right fit, we provide inquiring clients with names of professionals I recommend depending on the specifics of the engagement. If it’s a Visual Coach that is needed, I direct clients to my services and my Directory of Visual Coaches. If it’s a Visual Recorder or Visual Facilitator that is needed, I give the names of three professionals in their general region that I feel would be a fit. (FYI, if you are a Visual Practitioner interested in being on my referral list, contact us at admin@shift-it-coach.com to discuss qualifications and terms). Other great resources for finding Visual Practitioners (although you’ll have to sort out the Illustrators & Scribes from the true Visual Facilitators) are a couple of geographical directories. The first is the directory for The International Forum of Visual Practitioners (IFVP). Their newly refreshed site is http://ifvpcommunity.ning.com (although it seems to be missing the handy geographical directory that it used to have). What is the professional’s defined role (scribe, facilitator, coach, etc)? Level and length of experience? Experience with your type of company or content area? Do they LIKE/ENJOY that type of work? Availability and willingness to travel and requirements? 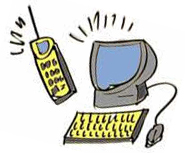 Availability for exploratory and design calls? Back up in case of emergency? Ability to expand team if necessary (add more scribes, bring in illustrators for custom charts or videos)? Working visually can be VERY rewarding if you have the right professional for the job — and are using the medium intelligently. While awareness about Interactive-Visuals is growing, it’s still a niche field. As such, you have the opportunity to be a pioneer in bringing this effective methodology into your own company, organization or environment and being on the leading edge of doing GREAT meetings and events. May the marker be with you!!! is there any certification for visual facilitation? We offer a Visual Coach Certification (application of the base visual skills towards coaching and personal growth). See our Fundamentals of Interactive-Visuals workshop for developing base skills in Custom Chart Work, Visual Recording/Scribing, Visual Facilitation and Visual Coaching.